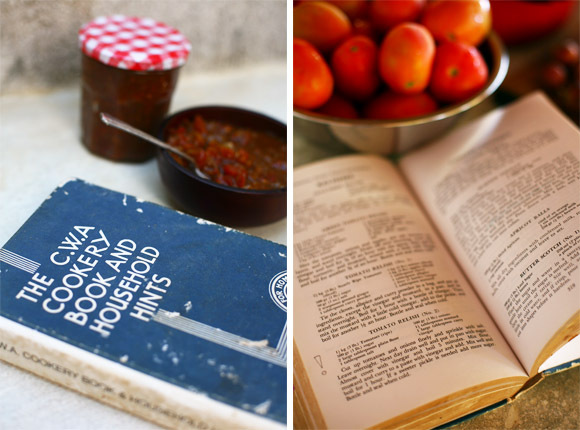 The markets are sporting tomatoes by the bucket full at a very low price, so I called upon my pioneering spirit and the Country Women's Association bible of cookery and household hints to make an old fashioned tomato relish. The aroma taps into my olfactory memory of delivering dad a packed lunch or dinner during seeding and harvest on the farm. Cheese, corned beef and tomato relish eaten beside the tractor; the moist ground freshly tilled or a cloud of wheat dust hanging in the hot air. Cut up tomatoes and onions finely and sprinkle with salt. Leave for 6 hours or overnight then drain well. Put into saucepan, add sugar and enough vinegar to just cover. Boil for 5 minutes. Mix flour, mustard and curry to a paste with a little vinegar. Add to pan and stir well. Simmer for 1 hour, or until desired thickness is reached. If you like a sweeter pickle, simply add more sugar. Allow to cool, then bottle in clean jars. Refrigerate after opening.